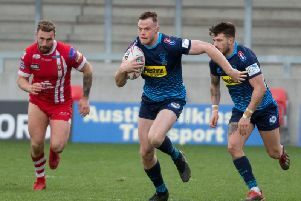 Wigan interim head coach Adrian Lam says he is exhausted after watching the Super League champions end their losing run, a day after witnessing his son make his NRL debut for Sydney Roosters. "It's been an emotional week," he said. "I'm exhausted now purely off the back of the win today and Lachlan making his debut yesterday. "It was a pretty special moment and I've just got make sure I don't get emotional because they're all bagging me for being an emotional father. "I'm just proud of him and happy that he played well. He set up a try and defended really great. It's been a childhood dream of his to wear the red, white and blue."